The Leibniz Supercomputing Centre of the Bavarian Academy of Sciences and Humanities in Germany (LRZ) has joined the OpenMP Architecture Review Board (ARB), a group of leading hardware and software vendors and research organizations creating the standard for the most popular shared-memory parallel programming model in use today. 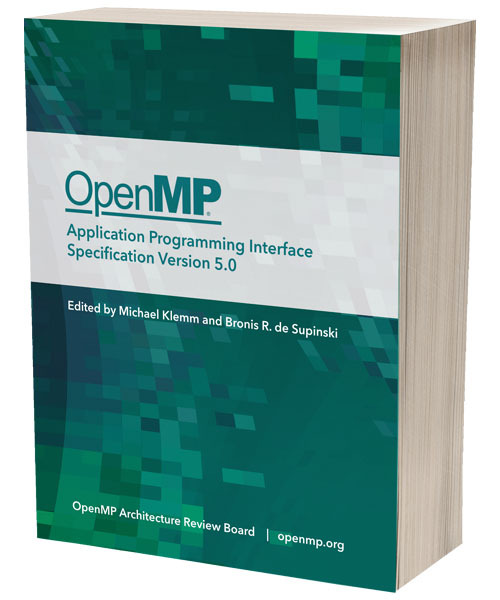 The OpenMP 5.0 Specification is now available as a softcover book on Amazon. The Maui High-Performance Computing Center (MHPCC) and the University of Manchester have joined the OpenMP ARB. This brings the number of vendors and research organizations now collaborating on developing the standard parallel programming model to 33. OpenMP @ SC18 Dallas, TX. tim.lewis	2018-11-08T17:41:18+00:00	Oct 25, 2018|Comments Off on OpenMP @ SC18 Dallas, TX. SUSE and the University of Delaware have joined the OpenMP ARB, a group of leading hardware and software vendors and research organizations creating the standard for the most popular shared-memory parallel programming model in use today. Get all the latest API specifications, technical report drafts and proposals. All the latest books, examples and tutorials to start you on your journey. Ask the experts and get answers to all your questions in the OpenMP forum. A wide variety of compilers are available across an ever widening range of platforms. The OpenMP API supports multi-platform shared-memory parallel programming in C/C++ and Fortran. The OpenMP API defines a portable, scalable model with a simple and flexible interface for developing parallel applications on platforms from the desktop to the supercomputer.